The group of world's eight most powerful industrialised countries, the G8, which controls more than 60 per cent of the world's economy, has declared it will "consider seriously" steps to deal with climate change at the 33rd annual summit of its leaders in this town on the Baltic coast. German chancellor Angela Merkel announced a breakthrough on June 7; by the time the summit declaration was released, it was obvious that she was trying to save face. The targets Merkel had proposed--that G8 countries do not let the world's average temperature increase by more than 2C by 2050, and for that agree to cut greenhouse gas emissions to half of 1990 levels--had not been agreed upon by G8 leaders. The fig-leaf was the agreement, most notably by the us, to work within the United Nations Framework Convention on Climate Change, signed at the Rio Earth Summit in 1992. The us under President George W Bush in 2001 walked out of the Kyoto Protocol, the 1997 treaty under the convention that fixed the historical responsibility of climate change on industrialised countries, which agreed to reduce their greenhouse gas emissions by 5.2 per cent of 1990 levels in the first commitment period of 2008-2012. The G8 declaration means when the 13th conference of parties to the climate convention meets in December 2007 in Bali, Indonesia, there will be some drafts ready for negotiating emissions reductions after the Kyoto deal ends in 2012. As the annual G8 summits go, this was slightly unusual. Top of the agenda was tackling climate change--this was the first after the Fourth Assessment Report of the un's Intergovernmental Panel on Climate Change reaffirmed that climate change was caused by human activity, that it was very real, and was happening faster than previous estimates. Apart from host Germany tabling a draft action plan for discussion, the world's top two polluters, the us and China, had both announced their own plans to deal with climate change in the run-up to the summit (see box Impasse). The summit declaration announced on June 7, however, was, at best, insipid. It reflected clearly that G8 leaders do not see a political future in addressing climate change, though it has acquired centrestage in popular culture and even industry accepts its inevitability. Bush is not the only one to blame. It should be shared by leaders of countries that failed to persuade the us to climb down from its stand that any agreement on cutting greenhouse emissions should include China and India, which are not required by the Kyoto treaty to cap emissions in view of their need to grow. German build-up G8 is an informal forum created in the mid-1970s (called G7 then; Russia joined later) in the aftermath of the oil shock to discuss and coordinate economic policy; it includes the us, Canada, Japan, Germany, France, Italy, the uk, and Russia. With climate change increasingly becoming an economic concern--greenhouse gas emissions are linked to economic growth--this summit was supposed to bring about agreement between the biggest polluters on reducing emissions. This was also to set in motion the process for emission cuts after the Kyoto Protocol's lapse. Most keen on an agreement was Merkel. Climate change is a political issue in Germany, and the chancellor wants to lead the international initiative. Her administration had prepared a draft declaration to be discussed at the summit. But a draft leaked in May, when compared to the draft Merkel took to the summit, showed it had been watered down. The international media showed how the May draft treated climate change as a fact, while the eventual document had the words "our world is warming" in square brackets, indicating disagreement among the countries. The May version spoke of committing money to energy projects, which also disappeared in the eventual document. Walden Bello, Filipino sociologist and political analyst, wrote "The reason the draft declaration cannot call for deeper cuts in greenhouse gas emissions is that its authors realise that maintaining a growing 'efficient and competitive economy' while radically reducing greenhouse gas emissions is not technologically feasible (now). The solution lower the targets and try to convince the public that this is simply being realistic." On May 31, in the run-up to the summit, Bush announced an initiative to tackle climate change. "The United States will work with other nations to establish a new framework on greenhouse gas emissions for when the Kyoto Protocol expires in 2012... This new framework would help our nations fulfil our responsibilities under the un Framework Convention on Climate Change. The United States will work with all nations that are part of this convention to adapt to the impacts of climate change," he said in a speech to the us International Development Agenda. The speech was significant, even though it undermined the convention for the first time, Bush had acknowledged the need to do something about climate change. But this was only lip service in reaction to growing public opinion in the us in favour of action against climate change. This change in opinion has to do with the destruction caused in August 2005 by Katrina, the deadliest and costliest hurricane in us history; several states in the us have announced their plans to reduce greenhouse gas emissions. This has three big us automakers worried they have been lobbying Congress and White House for federal standards in favour of varying standards in different states, which would affect their business adversely. Bush's May 31 speech was actually in line with the us position that it would not undertake any binding emissions caps unless growing economies like China and India also take them on, because he fears it would give industry in the developing countries an "unfair advantage". This flies in the face of the historical responsibility of industrialised countries, the us more than any other, for emitting greenhouse gases while industrialising. 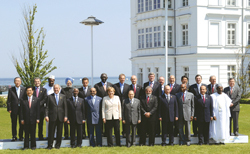 The declaration of Heiligendamm also makes no mention of the G8 countries' historical onus. It has become customary since the 2005 summit at Gleneagles, Scotland, for the G8 to invite the five biggest developing countries--Brazil, China, India, Mexico and South Africa--for discussions on reducing greenhouse gas emissions, though they don't have emissions caps in the Kyoto Protocol. Called the O5 (for Outreach 5), the developing countries don't like the term, and prefer G5. China, under increasing pressure to cap emissions since it is the world's second largest emitter now, announced a national plan to address climate change on June 4. The Indian government said it had already done the same in 2006 under the National Environment Policy. It issued a release that detailed the country's greenhouse gas footprint. Both India and China categorically dismissed any talk of taking on emissions caps as they were not responsible for emissions of the past, declaring they were doing what they could domestically to reduce emissions and become more energy efficient. But India defends the Asia Pacific Partnership on Clean Development and Climate, a us-led non-treaty agreement between Australia, India, Japan, China, South Korea and the us. It has been criticised for giving the us cheap publicity without addressing climate change and undermining multilateralism.